HOW LONG DO YOU THINK A COLLEGE COACH WILL VIEW AVERAGE GAME FILM? 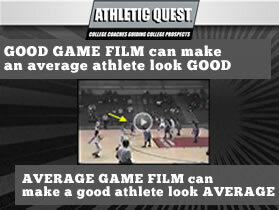 Did you know a Good Highlight Tape can get you looked at by College Coaches? And Bad Footage will get you dropped! 90% of initial recruiting done by College Coaches now takes place over the Internet! You cannot afford to lose chances. As College Coaches, we understand this and have developed a Professional Editing Highlight Program in a format College Coaches want to see. If you don't have the right highlights or don't have them in a correct order or format you will lose recruiting opportunities!